How to maintain your growth trajectory. Most practice owners reach a point where there is simply not enough of them to go around. For me, that time came after we expanded to a second location, experienced several key staff turnovers within the following 6 to 18 months, and geographically moved our original clinic. We were suddenly no longer maintaining our previous growth trajectory. I could not fully leverage the strategies I had used in the past to build our practice primarily because I was stretched too thin. As a result, our remaining seasoned clinicians simply were not providing care to a large enough percentage of the total patient visits. New staff members were up and coming, but they did not receive the same attention that had benefited both our earlier staff members and the practice. 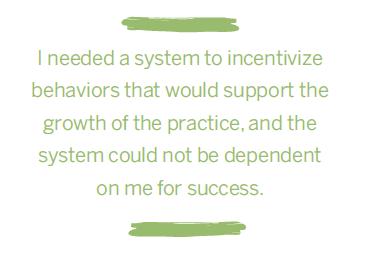 I needed a system to incentivize behaviors that would support the growth of the practice, and the system could not be dependent on me for success. 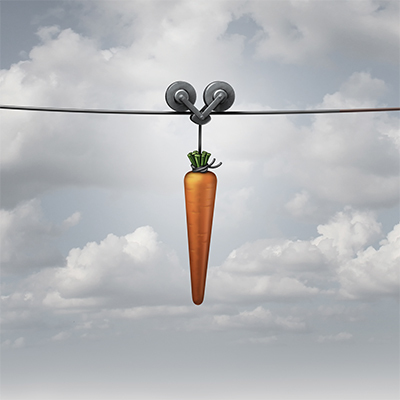 Initially, I attempted some basic goal setting with incentives for reaching those goals. I quickly determined that my new staff could not identify the type of behaviors and actions that would result in goal attainment. In the end, we failed to reach our goal miserably. I was jittery, and they were completely demoralized. Not to be dissuaded, I dug in and better prepared us for success before setting the next goal. I read The 4 Disciplines of Execution: Achieving Your Wildly Important Goals by Chris McChesney, Sean Covey, and Jim Huling1. While I did not follow it completely, the book helped me achieve a better understanding of how to break down big goals into smaller, attainable daily actions, incentivize the completion of those actions, and institute a system of accountability. First, I identified the behaviors and short-term indicators that would have the greatest impact on practice growth. These were items that the staff’s actions could directly impact. These items are listed in Table 1. Second, with the input of the staff, these behaviors and short-term outcomes were assigned points. The therapists had an opportunity to give feedback and add to the items on the list. Finally, in addition to tracking behaviors on a monthly scorecard, we measured long-term progress toward new episodes of care, compared with our targets, patient satisfaction, and treatment results. An analysis of clinic performance for the prior year identified that while patient outcomes had never looked better, satisfaction with the treatment provided, as well as the results of the treatment, had declined when compared with high-growth years. I determined that our clinicians were not adequately seeking patient feedback on the plan of care and throughout the episode of care. To encourage this patient engagement, I began reporting this number monthly. Within four months, we began to see a significant change in our practice growth trend line, reversing a declining trend along with an improvement of 4–8 percentage points in treatment satisfaction and treatment results. An unexpected benefit was that behaviors that I had never effectively policed in the past were becoming automated for our clinicians. This eased my frustrations with implementing new procedures and improved my time management. Keys to success included implementing systematic methods for monitoring the awarding of points. For example, thank you note points were awarded by the administrative staff who addressed the envelopes, and I was blind copied on emails that I could quickly scan for any issues and drop a note into a file for each therapist. Points to be awarded were determined by a quick count at the end of the month. Finally, a weekly check-in became one of the biggest contributors to our success. With alternating schedules and therapists in two locations, we struggled to schedule a live check-in. We created a weekly task list in our project management software in which each staff member could record their actions for the past week, report their intentions for the current week, and share the barriers they were experiencing in contributing toward organizational goals. This check-in took only a few minutes, added another level of public accountability to their peers, and allowed for coordination to occur more easily among staff members. In the sample graph, Therapist B would feel pressure to match his or her peers the following month, which I have seen occur. In our first month, only 300 total points were awarded, but by month four, we were nearing 1,000 team points collectively! Points were directly correlated to an end of year bonus for staff members. No matter the month-to-month variation, each point would be worth a dollar for meeting our year-end target for total new episodes of care. If we exceeded or missed our target, the points were worth a corresponding percentage more or percentage less. While an all-or-nothing goal can be very motivating, I wanted a no-risk option in place after our miss the prior year. In addition, since administrative staff has a large role to play in supporting the scorecard behaviors, as well as securing the scheduling of new episodes of care themselves, they also had a bonus tied to meeting our annual goal. With regard to the many well-researched and comprehensive business success strategies published, including The 4 Disciplines of Execution, one must know when to deviate from and modify a program to meet the needs of your team with the time and financial resources available. Implementing the program in step-wise manner was exactly what our staff and practice needed to make progress toward our clinic’s goals. 1 McChesney C, Covey S, Huling J. The 4 Disciplines of Execution: Achieving Your Wildly Important Goals. New York: Simon & Schuster; 2012. 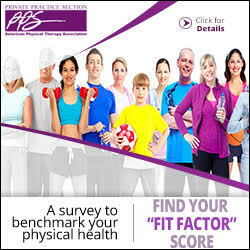 Angela Wilson Pennisi, PT, MS,is treasurer of PPS and owner of PhysioPartners in Chicago, Illinois. She can be reached at angelawpennisi@physiopartners.com.